Ransom is defined as the practice of offering something of value for the release of someone held prisoner. It was once understood that our sins condemned us and prevented us from an eternal relationship with God. We were prisoners on account of our sinful nature. And then Jesus offered himself as a ransom for us. He offered his perfect being to renegotiate our relationship with God. The ransom – the gift of his teachings and then the tragedy of his torturous death – was offered in fulfillment of scripture. The resurrection was the acceptance by God of that ransom. The covenant was made. It was made for our benefit. It was made for you and for me, and not because we belong to a specific church or not. It was made without precondition and without a church even formed. Offers and acceptances are made every day, to secure promises and make them ironclad. Perhaps it is the lawyer in me that sees the promise in the events of Easter. Jesus offered himself for the sins of man. And God accepted that offer. Although he was the Son of God, he still retained his free will to the end. He prayed and reflected on what he should do, and we know what he hoped wouldn’t be asked of him. In the end, he willingly accepted his fate. On Easter Sunday, when Jesus was raised from the dead, the covenant was complete. “The blood of the new and everlasting Covenant.” It had to be something audacious to demonstrate the divine hand of God. When we think of Easter, we instinctively recall that God sacrificed his only Son for our sins. In thinking of Easter in these terms, I am reminded of the account in the Bible when God asked Abraham to sacrifice his only son. God commanded Abraham to sacrifice his son, his only son Isaac, the only child of his beloved wife Sarah, the son promised to him by God. As a show of his unwavering faith, he took his son to the region of Moriah, built an altar and arranged the wood on it. He then bound his son Isaac and laid him on the altar, on top of the wood. As he reached out his hand and took the knife to slay his son, an angel of the LORD called out to him from heaven, and instructed him to stop. The point was for Abraham to demonstrate that he trusted God completely. God was testing his faith, his loyalty, and perhaps his love. He refused to allow Abraham to carry through with the act because He doesn’t believe we should be tested by pitting our love for one another, especially our children, against our love for Him. And yet, that is exactly what God did for us at Calgary (aka, Golgotha). He sacrificed his Son, born of flesh and blood, and without sin, for us sinners. Jesus endured hours of unspeakable brutality at the hands of the Romans. And then, he suffered unimaginable agony on the cross for almost six hours, hanging against a wooden cross with large nails through his flesh with the weight of his body burdening his respiration. By 3:00 in the afternoon, Jesus knew that the hour was finally at hand, and in fulfillment of the scriptures, he said, “I’m thirsty.” A jar of sour wine was sitting there, so a sponge was soaked in it and held up to his lips. When he had tasted it, he said, “It is finished,” and bowed his head and dismissed his spirit. How could we sinners be worthy of such a perfect sacrifice? Just as the sacrifice was proof of Abraham’s faith and loyalty, Jesus’ death was likewise a sacrifice. It is proof of God’s eternal love for us and his sincere promise to share eternal blessings with us who believe. He wants to share His kingdom of Heaven with us, even when we are not all that we can – should – be. 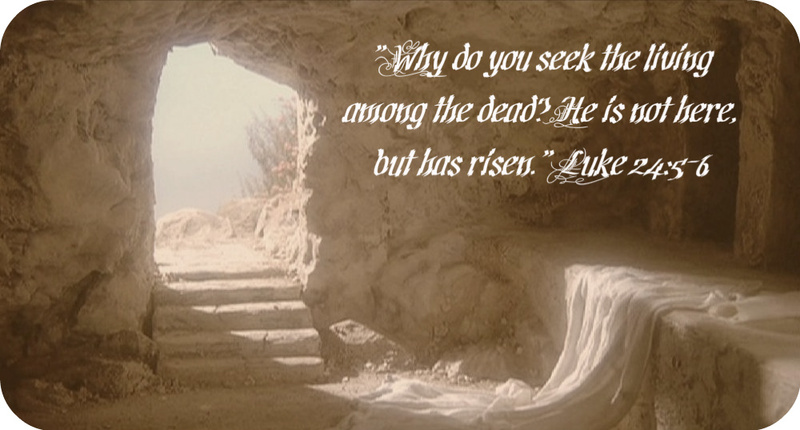 Easter reminds us of God’s relentless desire for our heart and soul. He sent His only son to suffer and die to make that clear to us. The cross reminds us of that unconditional love….. the compact; the Covenant; the promise. Again, that act was personal. There should be no greater reason to live life to the fullest and with the greatest intentions than because of the selfless act – the sacrifice – at Calgary. Yes, sometimes life is tough and there are seemingly insurmountable obstacles to happiness and self-worth, but when those doubts creep in, we should remember what Jesus went through to show how much he believes each of us are worth and how costly that price was.